Firefighters are battling to contain the Holy Fire that has already prompted evacuation orders for more than 20,000 people south of Los Angeles. 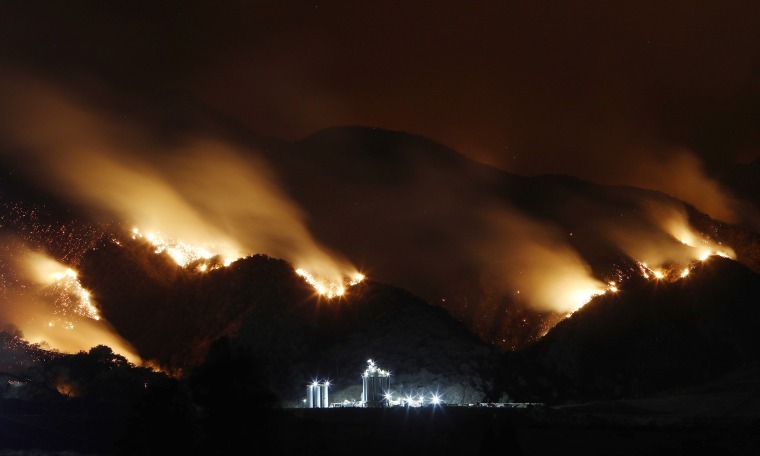 Smoke from the Holy Fire burning in Cleveland National Forest seem above an industrial storage facility in Corona, California, is blurred in a long exposure on Aug. 10, 2018. Fire crews line up as they watch a wildfire on a ridge top while protecting a residential area in Lake Elsinore. 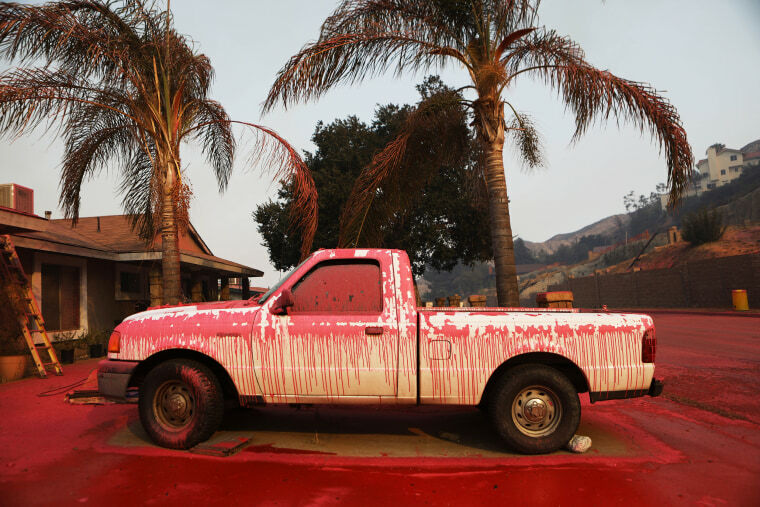 A vehicle and driveway are covered in fire retardant after it was sprayed from a firefighting aircraft in Lake Elsinore. 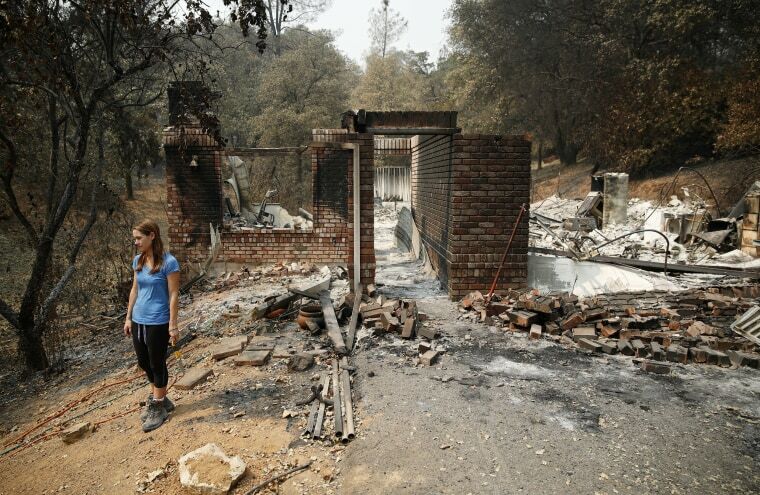 Emily Scott stands near the ruins of her house burned in the Carr Fire in Shasta, California. 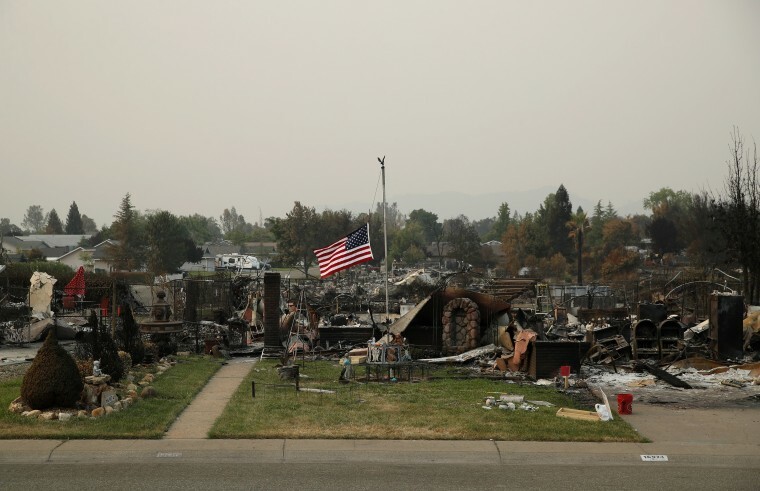 A flag flies at half staff amid the rubble of homes burned in the Carr Fire, in Redding, California. 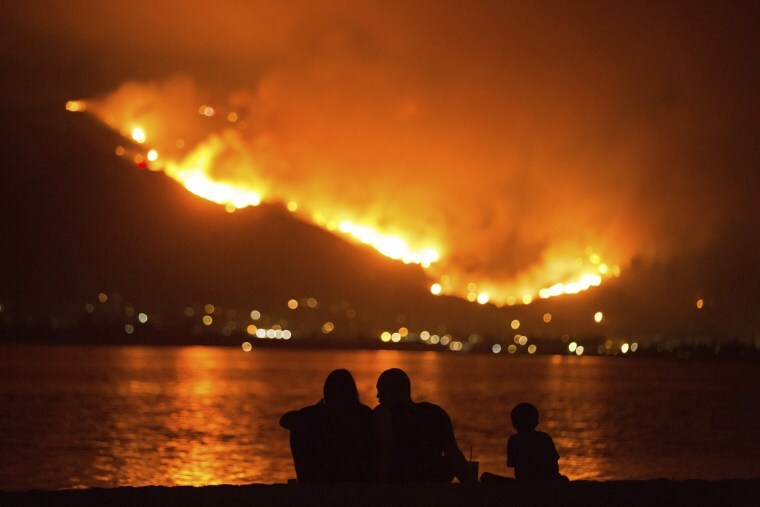 A family sits along the shore of Lake Elsinore as they watch the Holy Fire burn in the distance on, Aug. 9, 2018. 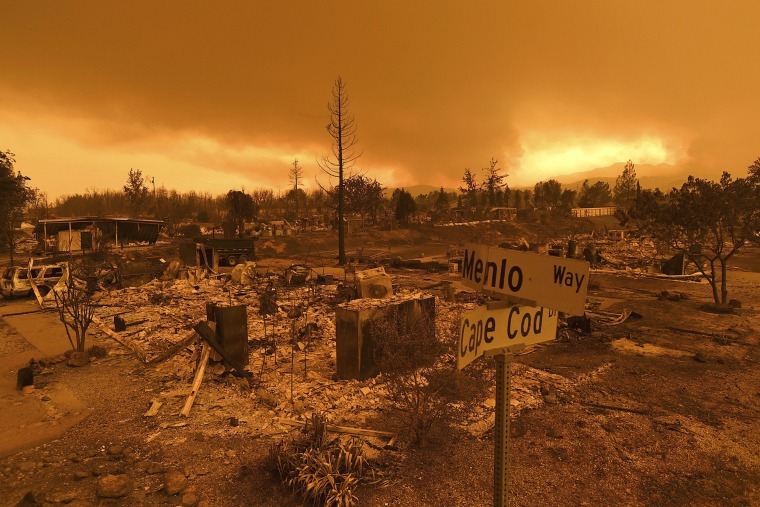 View of damage caused by wildfires near Redding, California. 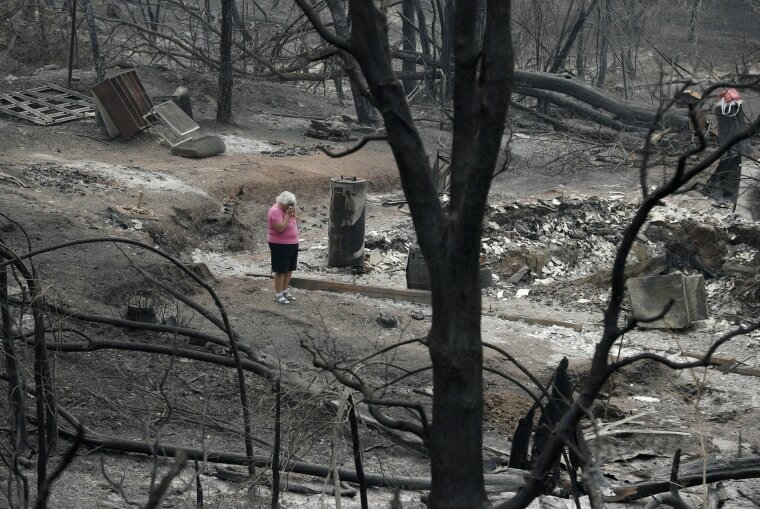 Loretta Root wipes her eyes while visiting the remains of her home in the Keswick area, which was burned in the Carr Fire in Redding. 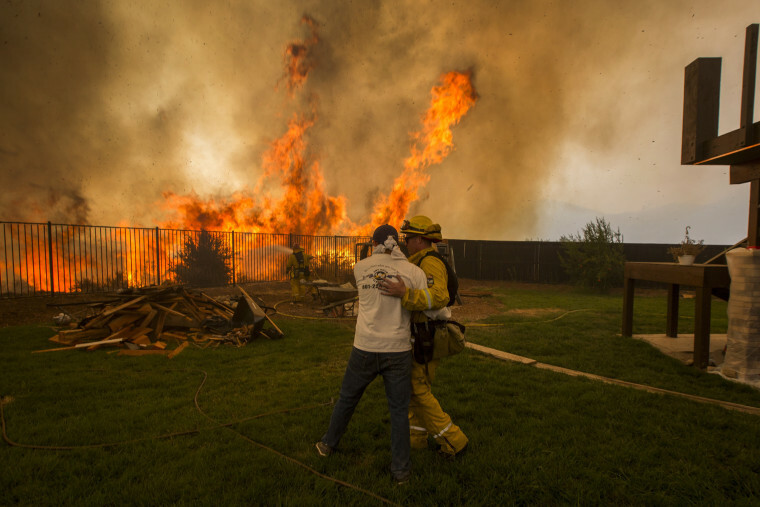 A firefighter consoles a man who is worried that his sister's house will burn during the Holy Fire in Corona, California. 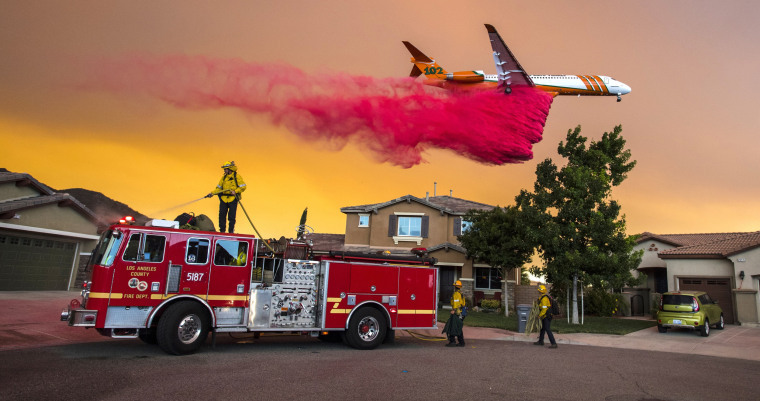 A plane drops fire retardant behind homes along McVicker Canyon Park Road in Lake Elsinore, California, on Aug. 8, 2018. A tree burns from the inside as the Ranch Fire burns in Clearlake Oaks, California, on Aug. 5, 2018. 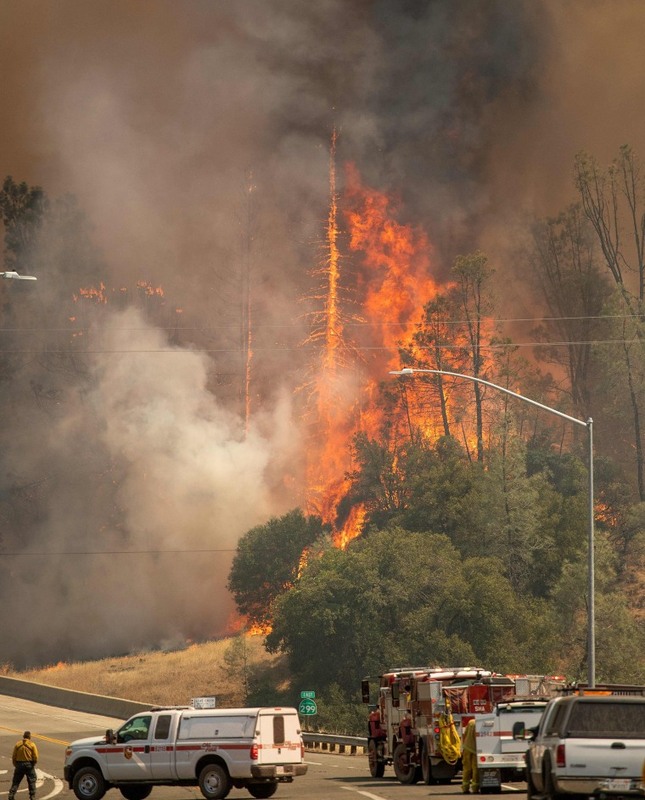 The Mendocino Complex blaze — a conglomerate of the River and Ranch fires burning in Northern California — became the state’s largest on record on Monday, scorching more than 290,000 acres, officials said. Embers smolder along a hillside after the Ranch Fire burned though the area near Clearlake Oaks. 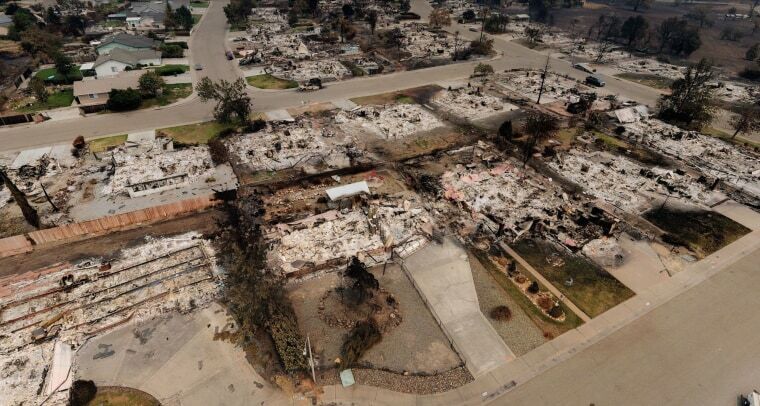 The Mendocino Complex fire has destroyed dozens of homes and other buildings, and more than 11,000 structures remain threatened. Flames leap above a vehicle near Clearlake Oaks. An air tanker drops retardant near Clearlake Oaks. Firefighter Joe Smith retrieves supplies while battling the Ranch Fire near Clearlake Oaks. 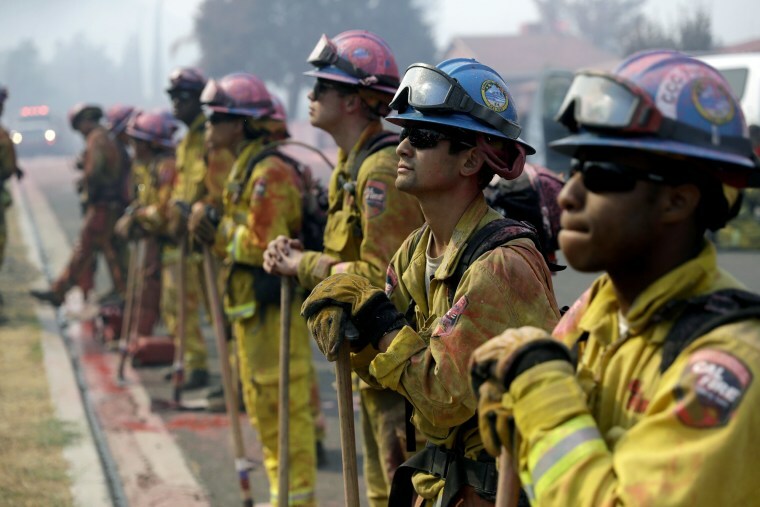 Nearly 4,000 fire personnel, including 441 firefighters, were battling the Mendocino Complex blaze. A residence on New Long Valley Road burns near Clearlake Oaks. Alex Schenck moves flaming pallets while fighting to save his home near Clearlake Oaks on Aug. 4. Alex Schenck carries a water bucket while fighting to save his home near Clearlake Oaks. The home survived the blaze. German astronaut Alexander Gerst captured this view of the California wildfires from the International Space Station on Aug. 3, tweeting "Frightening to watch, even from space." Firefighters conduct a controlled burn to defend houses against flames from the Ranch fire as it continued to spread towards the town of Upper Lake on Aug. 2. 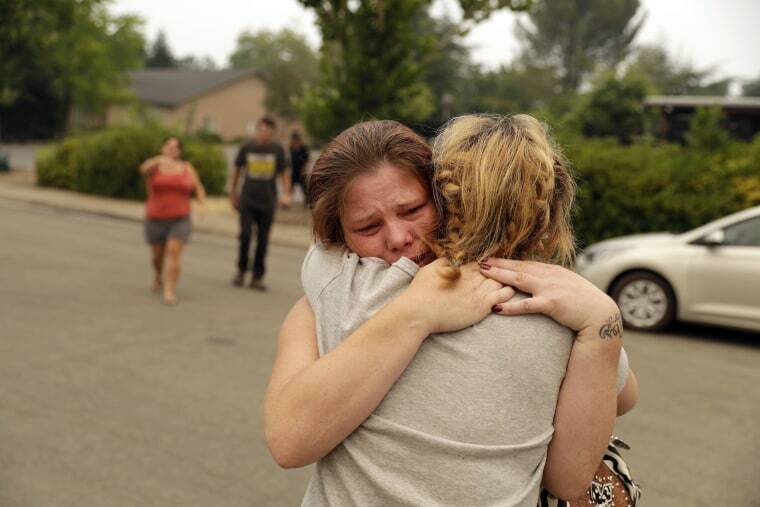 A resident is comforted after seeing her fire-ravaged home for the first time on Aug. 2 in Redding. 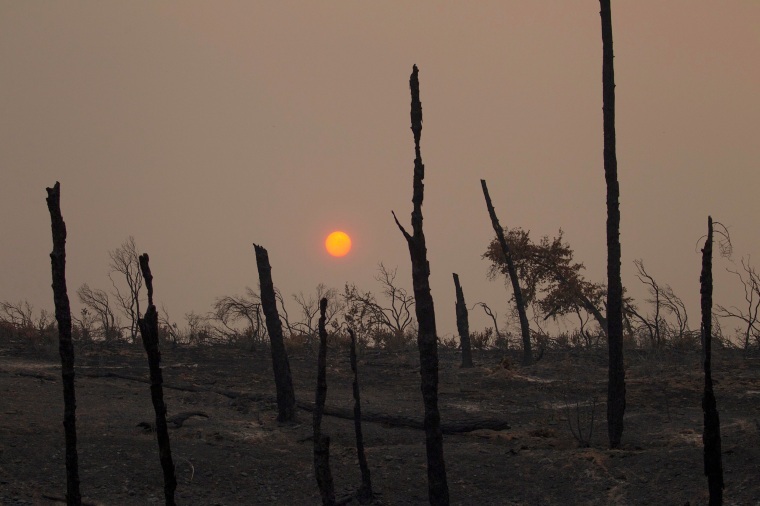 Seven people have died in the Carr Fire. Jim Daniel sleeps on a cot with his dog in the shade after being evacuated from the Mendocino Complex of fires to a makeshift evacuation center in the parking lot of the Moose Lodge in Clearlake Oaks. 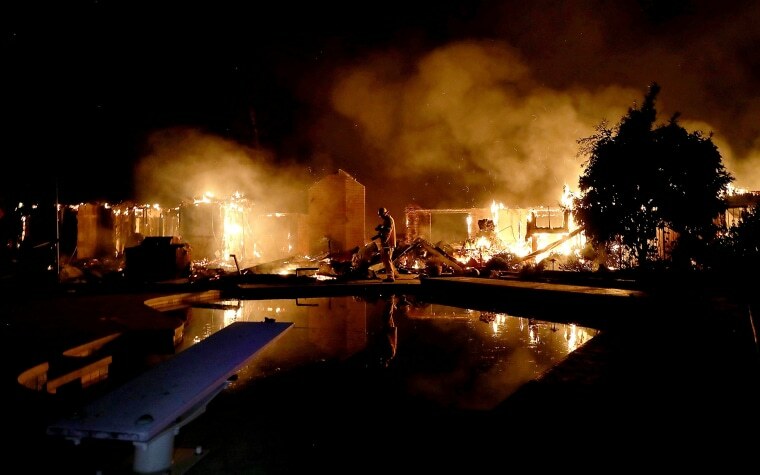 Chickens stand near a burning home as the River Fire moves through the area in Lakeport on July 31. Firefighters try to control a back burn as the Carr Fire continued to spread near Redding. The Carr Fire is believed to have started as a result of the mechanical failure of a vehicle, Cal Fire said. An air tanker drops fire retardant on the River Fire near Lakeport on July 30. A firefighter walks through smoke from the Mendocino Complex of fires. A vintage vehicle lies between trees burned by the Cranston Fire near Mountain Center on July 29. A dead horse is tangled up in a fence after being caught in the Cranston Fire in Mountain Center. Carla Bledsoe, facing camera, hugs her sister Sherry outside of the sheriff's office on July 28 after hearing the news that Sherry's children, James and Emily, and grandmother, Melody Bledsoe, were killed in a wildfire in Redding. The sun sets over hills burned by the Carr Fire west of Redding. 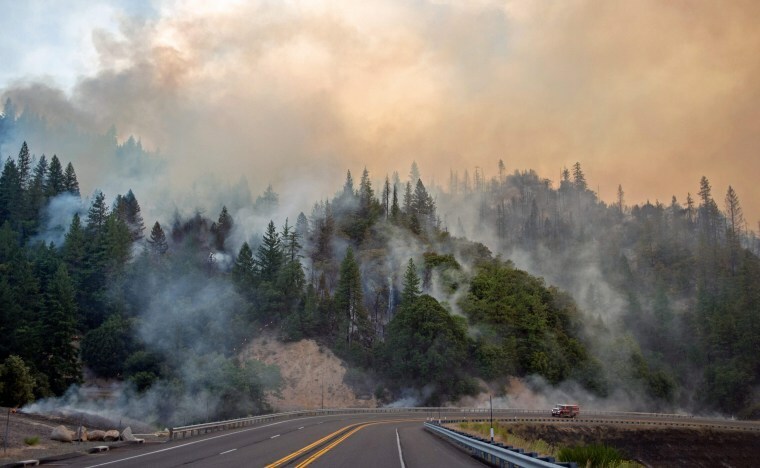 A fire truck battling the Carr Fire drives along Highway 299 near Whiskeytown, California. Homes leveled in the Lake Keswick Estates area of Redding. 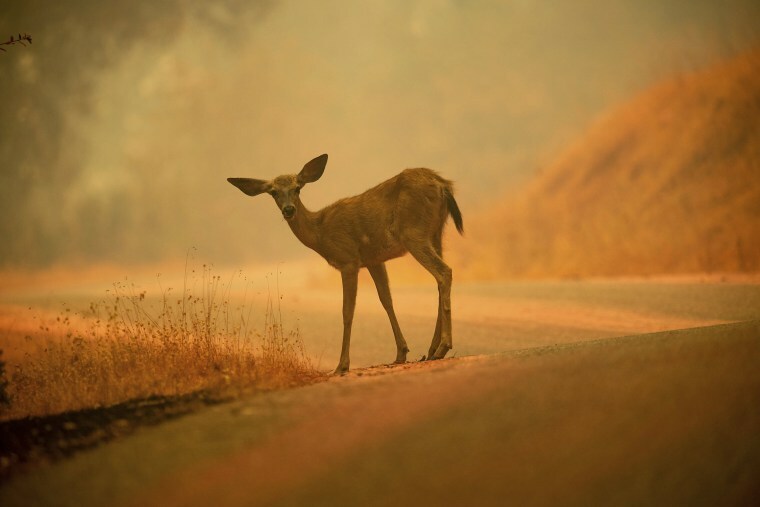 A deer grazes along a road covered in fire retardant near Redding. Flames tower above firefighters battling the Carr Fire near Whiskeytown on July 27. 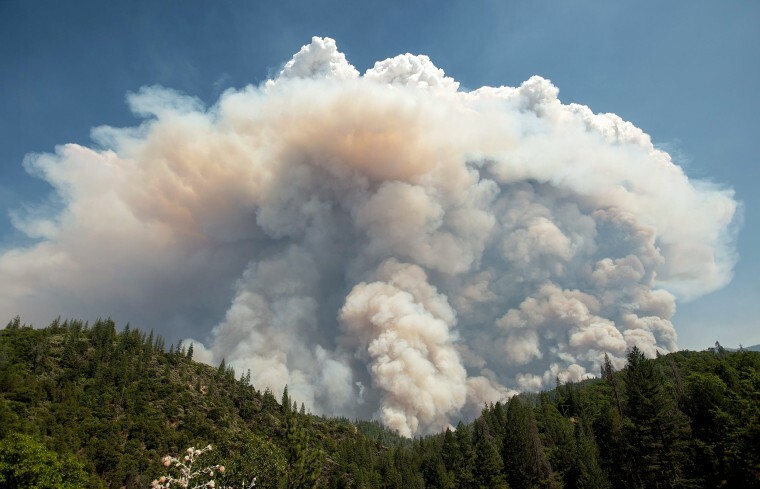 A large pyrocumulus cloud (or cloud of fire) explodes outward during the Carr Fire. 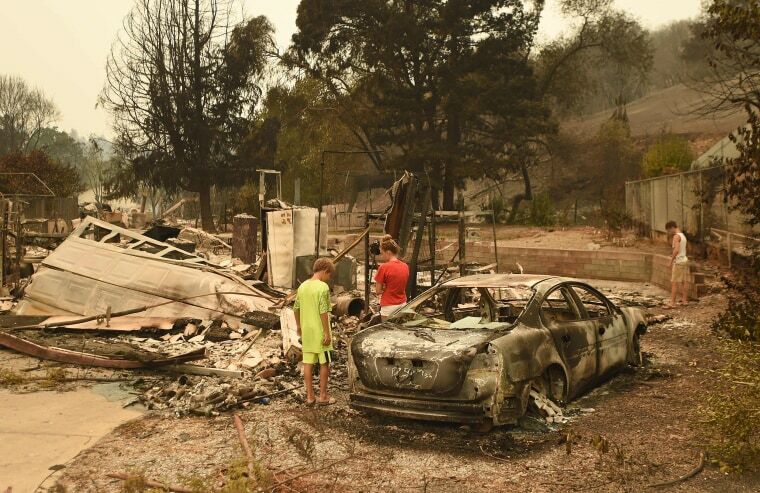 Children of the Brilz family look at the remains of their home in Redding. 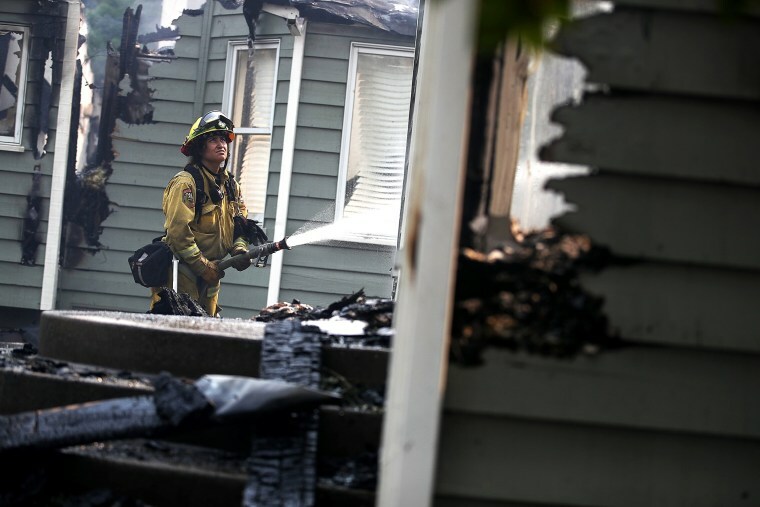 A firefighter sprays water on a home in Redding. A home burns along Sunflower Road in Redding. A historic schoolhouse burns as the Carr Fire tears through Shasta on July 26. A structure burns along Highway 299 near Redding. A water tender operator after trying to save a home in Shasta. A firefighter lights backfires in Redding.